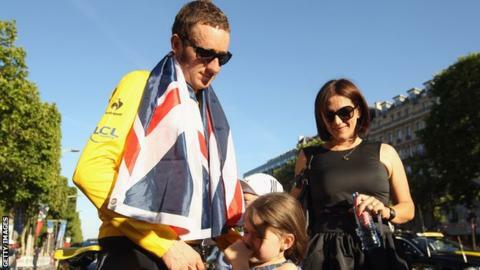 The wife of five-time Olympic champion Sir Bradley Wiggins has apologised for describing Chris Froome as a 'slithering reptile' on social media. Catherine Wiggins was responding to news of four-time Tour de France winner Froome's "adverse" drugs test. Her husband's former Team Sky team-mate recorded double the permitted limit of a legal asthma drug during the Vuelta a Espana. Froome, 32, says he "knows the rules" and there was "no wrongdoing". Froome has been asked by the UCI, cycling's world governing body, to explain why there was double the permitted level of the common asthma drug salbutamol in his urine when he was tested during the Vuelta in September. But the Briton told the BBC he has not "broken any rules" and does not believe his legacy will be tainted by the drugs test result. "I am going to be sick. Nothing in the news. If I was given to conspiracy theory I'd allege they'd thrown my boy under the bus on purpose to cover for this slithering reptile." "Sorry everyone for my emotional comments and insults. Too much stress has got the better of me. Heat of the moment things and certainly not my intent to fan any flames." The wives of the two riders have previously clashed on social media while in January Froome said it was "healthy" to be asking why Wiggins was granted a therapeutic use exemption to take anti-inflammatory drug triamcinolone before the 2011 Tour de France, his 2012 Tour win and the 2013 Giro d'Italia.